Later this year, a sculpture by the internationally-renowned artist Monica Bonvicini will be unveiled on the plaza of the Olympic Handball Arena in Hackney Wick. 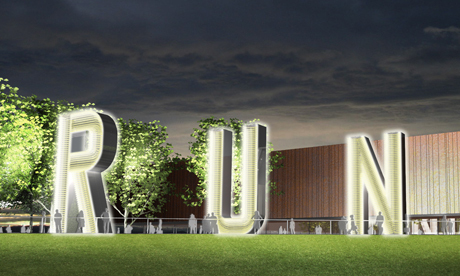 In announcing the sculpture, the Olympic Delivery Authority said that the permanent piece of public art will consist of three nine-metre-tall letters, made of glass and stainless steel, forming the word “RUN”. These materials will produce a mirrored effect that will change throughout the day as the light alters. 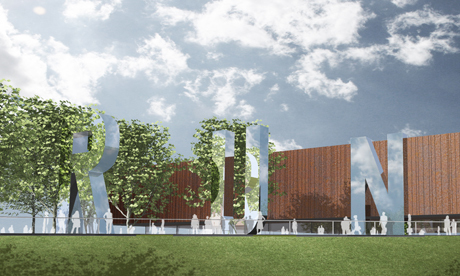 The sculpture will be a striking feature in the Olympic Park, particularly at night as the letters become more transparent with internal LED lighting creating a glow. Following the Athens Olympic Games in 2004, many of the sites in Greece were allowed to become derelict and run-down. However the London Games organisers have said that the legacy of the 2012 Games is a high priority. This has real significance as the sculpture’s inspirational slogan “RUN” could transform into an ominous warning in a barren and abandoned landscape. Venice-born Bonvicini now lives and works in Berlin. Since 1999 she has exhibited work in London, Chicago, Munich, Basel, Berlin and Oslo. Describing her inspiration for the piece she said: “Exactly ten years ago, I had a solo show titled “RUN, TAKE one SQUARE or two” which included the song Running Dry by Neil Young and reminded people of the famous Velvet Underground song Run Run Run. Sarah Weir, Head of Art and Cultural Strategy at the ODA, said: “A number of renowned artists were shortlisted for this commission but Monica’s proposal was chosen by an independent and expert panel because it fulfilled all the ambitions for this key location within the Olympic Park. The impact that art in the Park is having is visible around all five east London host boroughs as artists are given the opportunity to enliven bridges, underpasses and utility buildings. The ODA, alongside the Contemporary Art Society, also commissioned a special edition of ‘Shoreditch Star’, inviting local schoolchildren to engage with arts and culture.